On February 21, 2019, the heretofore unknown actor Jussie (Empire) Smollett was charged with felony disorderly conduct for allegedly filing a false police report in Chicago claiming he was the victim of a hate crime. The charge came from the Cook County State’s Attorney office. The state alleges Smollett filed a false report with Chicago police on Jan. 29, when he claimed he was assaulted by two masked men who hurled racist and homophobic slurs. Chicago Police Superintendent Eddie Johnson, speaking at a press conference, skewered Smollett and false police reports generally. He said that while no violent crimes went uninvestigated as a result of Smollett’s claims, Johnson suggested that the hundreds of killings in Chicago represented a more serious problem deserving of national attention than a celebrity’s allegedly false police report. Disorderly conduct is normally thought of as a low-level crime. In Illinois, however, making false reports to peace officers is actually a felony contained within the disorderly statute. A false report is a class four felony, punishable by up to three years in prison. The elements that make it such a felony are: any kind of transmission to a peace officer reporting a crime without reasonable grounds. I suggested that immediately after that excuse was offered. Look up tweet from day after the warrant issued. Lying Lib Media mocked me. Then I KNEW I was on to something. I have 40 years of law enforcement experience. On February 22, an editorial appeared in USA Today, ‘Hate crime hoaxes, like Jussie Smollett’s alleged attack, are more common than you think’. an associate professor of political science at Kentucky State University, a historically Black institution located in Frankfort. He is the author of the upcoming book Hate Crime Hoax, as well as The $50,000,000 Question, a book dealing with how people value identity. The questions here are obvious. How many Trump supporters even exist in the downtown of a city that went 83% for Hillary Clinton — and how many of them watch “Empire?” How many guys looking for a fight carry rope and bottles of bleach around with them? Almost every normal citizen had questions like these about this incident, and we were justified in having them. That this case turned out to be a hoax shouldn’t come as too big of a shock. A great many hate crime stories turn out to be hoaxes. 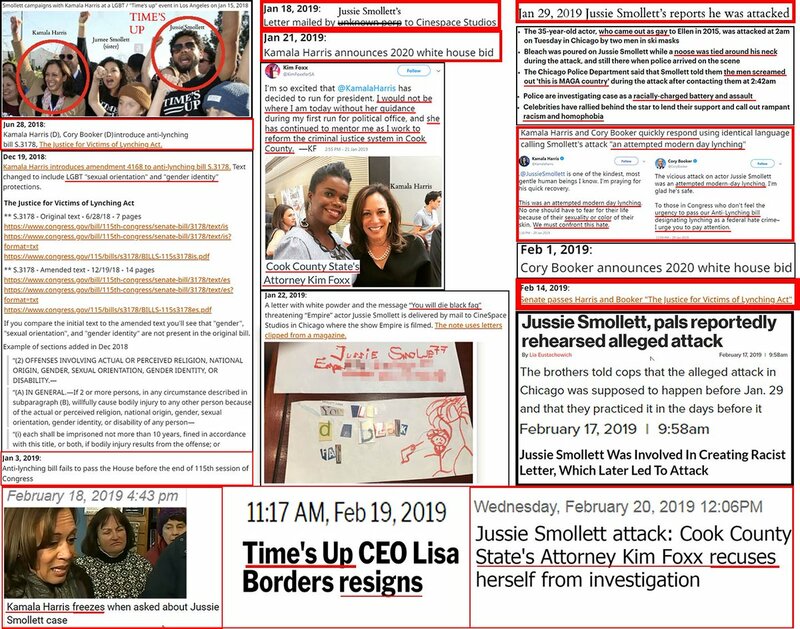 Simply looking at what happened to the most widely reported hate crime stories over the past 4-5 years illustrates this: not only the Smollett case but also the Yasmin Seweid, Air Force Academy, Eastern Michigan, Wisconsin-Parkside, Kean College, Covington Catholic, and “Hopewell Baptist burning” racial scandals all turned out to be fakes. And, these cases are not isolated outliers. Therefore, of the 7,000 real hate crimes, a small number actually make a researcher’s list. In order to make the researcher’s list, they have to appear in the media. Ironically, it would seem that we hear more about the hoaxes than the real hate crimes. 84% of white murder victims and 93% of Black murder victims are killed by criminals of their own race, and the person most likely to kill you is your ex-wife or husband. When violent inter-racial crimes do occur, whites are at least as likely to be the targets as are minorities. Simply put, Klansmen armed with nooses are not lurking on Chicago street corners. Henry Hay executed in the electric chair. James Knowles and an accomplice sentenced to life in prison. Civil suit against United Klans of America caused their bankruptcy. what hate hoaxers actually do is worsen generally good race relations, and distract attention from real problems. As Chicago’s disgusted top cop, Police Superintendent Eddie Johnson, pointed out yesterday, skilled police officers spent four weeks tracking down Smollett’s imaginary attackers — in a city that has seen 28 murders as of Feb. 9th, according to The Chicago Tribune. We all, media and citizens alike, would be better served to focus on real issues like gun violence and the opiate epidemic than on fairy tales like Jussie’s. Were it not for a diligent citizen social media, Jussie Smollett’s hoax could have run for much longer and done irreparable damage to the fabric of America. As it was, good people everywhere put their heads together across the country and pieced the puzzle together online. This is yet another example of citizen media doing the job of supposedly legitimate media. For Monday, February 25, 2019. – 8:30am ET, participates in the 2019 White House Business Session with Our Nation’s Governors. – 12:30pm ET, departs Washington, D.C., en route to Hanoi, Vietnam. Mike Pompeo seen boarding a military plane this morning at Andrews AFB to make his way to Hanoi, Vietnam for the TRUMP*KIM Summit. China is everywhere and I think you’d really amazed with what you see. Maybe. Let’s see what happens. We still have a little ways to go. Would you say that’s correct, Mr Ambassador? We have a little bit. But I want thank you, Bob, you’ve been working 24 hours around the clock and I will say this publicly, when I was able to be lucky enough to win the presidency I called Bob Lighthizer because for years people have known he’s the greatest trader that we have on this type of trade – we have many different types of trade – and I really understand now why. Thank you very much. Fantastic. Also, I was going to leave very early tomorrow, but now I’m going to do it a little bit later. I had an option to do it at six in the morning or 11 and I chose 11. I can spend a little bit of time with you tomorrow morning because you’re having a breakfast and I’ll come to the breakfast. But literally, I said what kind of an option is that, I can leave at six in the morning or 11? They said you can leave at six or anywhere between 11 and 12. I said I’ll take 11 to 12. But you’re having a breakfast so I’ll be with you at the breakfast. But we’ll be leaving for Hanoi, Vietnam, and we’ll be meeting with Kim Jong-un. It’s a very interesting thing to say but I’ve developed a very, very good relationship. We’ll see what that means but he’s never had a relationship with anybody from this country and hasn’t had lots of relationships anywhere. The media sometimes will say, well, what have they given up? We’ve given up nothing. The sanctions are on, everything’s on, but we have a special feeling and I think it’s going to lead to something very good and maybe now. I think ultimately it will, but maybe not, and I’m not pushing for speed but we’re not removing the sanctions. And we’re going to have, I think, a very interesting two and half days in Vietnam and we have a chance for the total denuclearisation of an area of the world that was very dangerous. When I first came in, or really more particularly at the end of the last administration, there were rockets going up, there were missiles going up, there were bombs going off, there were massive cannons being tested. If you ever saw the picture of the beach, I’ve never seen anything like it where you had literally thousands of cannons on the beach shooting out into the waters. And there was nuclear testing. In fact, they thought it was earthquakes. They said there are massive earthquakes and then they realised it was North Korea. They said wow, it’s maybe not an earthquake. Now there’s no testing, there’s no rockets, there’s no nuclear testing and we get along well, very well, so it will be very interesting to see. As I tell Chairman Kim, he has a chance to have a country that is so vibrant economically. Maybe one of the most in the world. He’s got a location that’s unbelievable. As a real estate person, I’ve always done well with location, but he’s right between China, Russia and on the other side South Korea, so they can’t touch each other unless they go through North Korea. And I say, you have one of the greatest locations, they have incredible people, hardworking people, smart, energetic, and I think it could be really one of the great financial and economic countries anywhere in the world. So I tell him that but I said you can’t do that if you’re going to keep nuclear. If you do nuclear, that can’t ever happen. And we see eye to eye, I believe, but you’ll be seeing it more and more over the next couple of days, one way or the other. What’s going to happen, I can’t tell you. I think eventually it would but I can’t tell you and I’m not in a rush, I don’t want to rush anybody, I just don’t want testing. As long as there’s no testing, we’re happy. So we’ve done really something, I think, very special with respect to North Korea and it’s a long flight and I’ll be back at the end of the week. But we have two very interesting days planned and I think it’s a very important thing. Prime Minister Abe of Japan said he can’t believe what’s happened in such a short period of time because rockets were being fired over Japan: rockets and missiles both. And now that hasn’t happened in long time, 16 months, 17 months, no more testing, no more rockets, no more checking to see whether or not this stuff works. So you’ll be seeing it and I think it’s going to be very interesting for people but there’s a chance to do something very, very special. It’s very exciting. And likewise, if we can do a great economic deal, it will be the largest trade deal ever made by far if you look at it, our deal with China, and we truly are very close. So those are a couple of very interesting things. But our country’s doing incredibly well economically. We’ve pick up in terms of value worth $18 trillion. Now China – I don’t want this – but China has lost about $44 trillion. So they were catching us, catching us, catching us, and now we’ve zoomed out. And I can say this: as long as I’m president, they’re not going catch us, and they’re going to do well – but I want them to do well, they’re not going to catch us. Governor Steve Bullock from Montana gave the toast. A prayer was then said. On February 27 and 28, 2019, President Donald J. Trump will meet with Democratic People’s Republic of Korea (DPRK) Chairman Kim Jong Un for a second summit in Hanoi, Vietnam. This summit aims to make further progress on the commitments the two leaders made in Singapore: transformed relations, a lasting and stable peace, and the complete denuclearization of the Korean Peninsula. The President has made clear that should North Korea follow through on its commitment to complete denuclearization, we will work to ensure there are economic development options. The United States and partners are prepared to explore how to mobilize investment, improve infrastructure, enhance food security, and more in the DPRK. Robust economic development under Chairman Kim is at the core of President Trump’s vision for a bright future for United States–DPRK relations. I hope that Kim has started feeding his starving people in the countryside. Man cannot live on a diet of dirt and dung. On Thursday, February 21, 2019, President Donald Trump and First Lady Melania Trump hosted a reception at the White House in honour of National African American History Month. Vice President Mike Pence and Second Lady Karen Pence were among the guests as were members of the Cabinet, Surgeon General Jerome Adams, Pastor Darrell Scott, Catherine Toney (released under the First Step Act), former civil rights leader Bob Woodson and Clarence Henderson (who sat at a segregated Woolworth’s counter in 1960). President Trump gave an inspiring talk, inviting his honoured guests to the podium. Excerpts from the transcript follow, emphases mine. THE PRESIDENT: … From the earliest days of this nation, African American leaders, pioneers, and visionaries have uplifted and inspired our country in art, in science, literature, law, film, politics, business, and every arena of national life. The depth and glory of these contributions are beyond measure. You know it. I know it. And everybody knows it. … We have Pastor Darrell Scott. Will you come up here, Darrell? Darrell. Darrell, get up here. (Applause.) He’s always defending me on television. (Laughter.) And I’ll tell you, if you want somebody to defend you, this is about as good as you can get. I want to — he is brutal. Sometimes I say, “You’re a pastor?” You’re the toughest pastor I’ve ever — (laughter) — thank you, Darrell. … I just want to say God bless you all and God bless America. Thank you for being at the White House. (Applause.) Thank you. Then, it was time for a buffet and refreshments. Remember these faces. These are the faces of Gen Z. And he was so close to getting there, too. I hope he will make a full and swift recovery. It seemed to be taking an awfully long time for him to get a hospital room. The traditional period of Shrovetide began last Sunday. In old money, the Sixth Sunday after Epiphany was called Septuagesima Sunday. February 24, 2019 is the Seventh Sunday after Epiphany and what would have been known as Sexagesima Sunday. Last week’s readings were sombre, calling upon the faithful to consider their iniquity. This Sunday’s focus on mercy and patience. The readings below are for Year C in the three-year Lectionary used for public worship. Emphases mine below. Joseph had a top position with Pharoah. He was known by an Egyptian name, Zaphnath-paaneah. In this passage, Joseph encounters his brothers who had sold him into slavery years before. He introduced himself by his given name, Joseph. He and his brothers reconciled. It was then time for them to tell Jacob about Joseph’s whereabouts and that the Lord would provide for the entire family during the famine. 45:3 Joseph said to his brothers, “I am Joseph. Is my father still alive?” But his brothers could not answer him, so dismayed were they at his presence. 45:4 Then Joseph said to his brothers, “Come closer to me.” And they came closer. He said, “I am your brother, Joseph, whom you sold into Egypt. 45:5 And now do not be distressed, or angry with yourselves, because you sold me here; for God sent me before you to preserve life. 45:6 For the famine has been in the land these two years; and there are five more years in which there will be neither plowing nor harvest. 45:7 God sent me before you to preserve for you a remnant on earth, and to keep alive for you many survivors. 45:8 So it was not you who sent me here, but God; he has made me a father to Pharaoh, and lord of all his house and ruler over all the land of Egypt. 45:9 Hurry and go up to my father and say to him, ‘Thus says your son Joseph, God has made me lord of all Egypt; come down to me, do not delay. 45:10 You shall settle in the land of Goshen, and you shall be near me, you and your children and your children’s children, as well as your flocks, your herds, and all that you have. 45:15 And he kissed all his brothers and wept upon them; and after that his brothers talked with him. 37:3 Trust in the LORD, and do good; so you will live in the land, and enjoy security. 37:4 Take delight in the LORD, and he will give you the desires of your heart. 37:5 Commit your way to the LORD; trust in him, and he will act. 37:6 He will make your vindication shine like the light, and the justice of your cause like the noonday. 37:7 Be still before the LORD, and wait patiently for him; do not fret over those who prosper in their way, over those who carry out evil devices. 37:10 Yet a little while, and the wicked will be no more; though you look diligently for their place, they will not be there. 37:11 But the meek shall inherit the land, and delight themselves in abundant prosperity. 37:39 The salvation of the righteous is from the LORD; he is their refuge in the time of trouble. 37:40 The LORD helps them and rescues them; he rescues them from the wicked, and saves them, because they take refuge in him. 15:36 Fool! What you sow does not come to life unless it dies. 15:37 And as for what you sow, you do not sow the body that is to be, but a bare seed, perhaps of wheat or of some other grain. 15:38 But God gives it a body as he has chosen, and to each kind of seed its own body. 15:42 So it is with the resurrection of the dead. What is sown is perishable, what is raised is imperishable. 15:43 It is sown in dishonor, it is raised in glory. It is sown in weakness, it is raised in power. 15:44 It is sown a physical body, it is raised a spiritual body. If there is a physical body, there is also a spiritual body. 15:45 Thus it is written, “The first man, Adam, became a living being”; the last Adam became a life-giving spirit. 15:46 But it is not the spiritual that is first, but the physical, and then the spiritual. 15:47 The first man was from the earth, a man of dust; the second man is from heaven. 15:48 As was the man of dust, so are those who are of the dust; and as is the man of heaven, so are those who are of heaven. 15:49 Just as we have borne the image of the man of dust, we will also bear the image of the man of heaven. 15:50 What I am saying, brothers and sisters, is this: flesh and blood cannot inherit the kingdom of God, nor does the perishable inherit the imperishable. 6:32 “If you love those who love you, what credit is that to you? For even sinners love those who love them. Those must be some of the most abused verses in the Bible and the hardest to live up to in this transitory life. Ultimately, try to do better than an unbeliever. Pray for more grace and for more fortitude to become more Christlike. CNN — and Democrat politicians — say that America was never great. Kudos to him for packing so much history into 45 seconds! I am pleased to say that Joel Patrick will be attending dinner at the White House in honour of Black History Month on Thursday, February 21. His contemporary, the redoubtable CJ Pearson, will be joining him. I am sure they will have the evening of their lives.